Maybe you are tired of seeing my posts about beauty boxes this week. It’s cool. I get it. But the middle of the month just happens to be the time when all my beauty bags/boxes typically arrive. So I’m going to be posting my thoughts as they arrive. So deal with it. 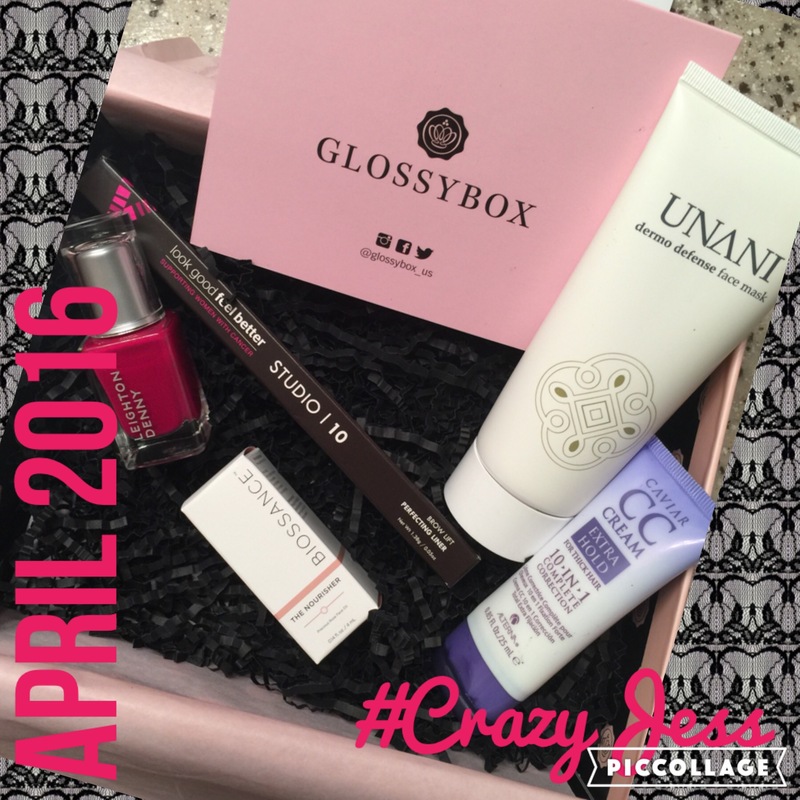 Yesterday I received the April 2016 Glossybox. I have only had a subscription for a short time as in this is only my 2nd box I’ve ever received. It’s $21 a month and is filled with 5 delux size sample and/or full size beauty items. It seems that GB gives you more full size items than other subscriptions so far but it’s only been two months so maybe that won’t continue. We will wait and see. The first months box was packaged perfectly with a perfectly tied black bow around the tissue paper. This month it looked like they threw my stuff in the box and forgot to tie it up and seal the paper with the usual Glossybox decal they typically use. But that is not a deal breaker for me. I just really enjoyed the presentation of the first months box and kind of expected it going forward. I’m interested to see how it will be next month. That is just a minor detail though and did not affect the quality of the box or the items I received. So basically I paid $21 (includes shipping) for $75 worth of products. Not too bad. I never would have tried any of these brands and haven’t heard of them actually until receiving this box this month. Another plus about the box this month is that three of my five items were full size. I am actually super excited about what I received as well. I’ve already tried the eyebrow pencil and love it. I’m very excited to try the face oil and hope it doesn’t break me out. Not sure how I feel about the hair CC cream but willing to give it a try. The nail polish is a beautiful color but I haven’t tried it yet since my nails are painted the purple color I received from my Ipsy bag this month currently so thoughts on that will be posted later. I think I’m the most excited about the face mask. It smells amazing but it actually smells pretty strong considering its for sensitive skin. So we will see how it goes. Fingers crossed my skin reacts well to it. So far I’d say this months box is another win and I will continue my subscription for a little while longer. April has been a good beauty bag/box subscription month so far! Have you ever subcribed to the Glossybox Monthly Beauty Box? Why did you stop? What do you think about the products if you are a current subscriber? Let me know your thoughts in the comments below.